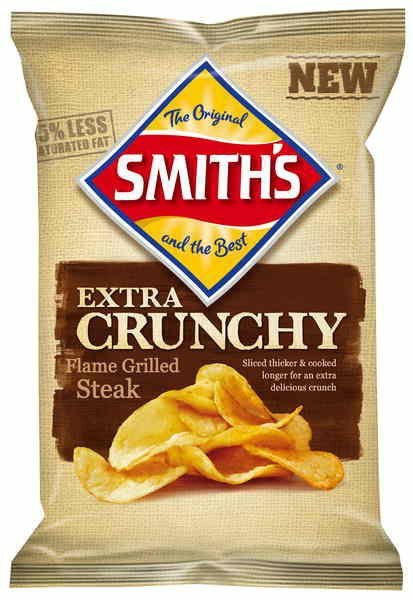 It says these Chips are 'Extra Crunchy' on the packet and that is exactly what they were. Rarely have we come across Chips as crunchy as these. The thickness allied to the hardened oil made for a firm crack and a gradual but slow decline in the solidity of each Chip. Where you may put several regular Chips into your mouth and munch away, these were a one at a time experience. Thickly cut and dry looking, these Chips had a solid feel about them. There were undulating oil blisters and a light dusting brownish coloured seasoning. There was skin on edges and most Chips were bendy and curly. A Nose Plunge Test revealed a beefy, almost Bovril type meaty aroma. The taste was similar. It was quite a strong and rewarding flavour, but it didn't taste like Beef that is merely 'Flame Grilled', the flavour was as if it were a product of the Steak sauce Americans often use for their grilled fayre. More Beef stock than Beef, as it were.